FROM SEVERAL TRAFFIC LANES over, in the dimness of street lights and headlights, I could not spot him. “There he is,” my husband said. I craned my neck, peering through the windshield, trying to glimpse our son whom I had not seen since July 7. Try as I might, I could not locate my 20-year-old in the throng of passengers awaiting curbside pick-up at Terminal 2 of St. Paul-Minneapolis International Airport a week before Christmas. I’d never seen the terminal so busy with vehicles stacked across all lanes in near gridlock. At 11 p.m. on a Thursday. I willed the monstrous white pick-up just ahead of us to the right to move. Move, will you, so I can see my boy. The truck inched forward, finally clearing a view of a lean young man towering even taller than I remembered. No wonder I barely recognized him. 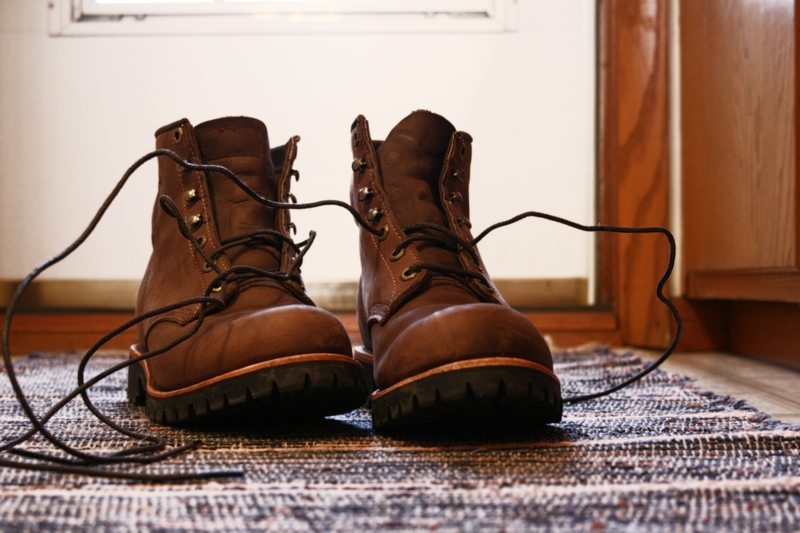 Chippewa boots have replaced athletic shoes. In six months, he’d grown. And his look, his clothes, had changed. He sported leg-hugging pants in rust-orange. Boots, not neon tennis shoes. A navy blue and white pom-pom stocking cap emblazoned with “Boston” topped his head. He’d ditched the ear muffs. His classic button down black wool coat had been replaced by a more trendy parka style jacket. And later, when he shed that outerwear, I noticed he was dressed in fashion conscious layers. I’d been searching for a young man dressed like I remembered. Eighteen months away from the Midwest, my son’s finally found his fashion niche. And I must say the new look suits this Tufts University computer science major-math minor student. He seems comfortable and confident sporting pants that aren’t jeans, in hues of rust, green and grey. I have yet to see him wear jeans since his arrival home on December 18. 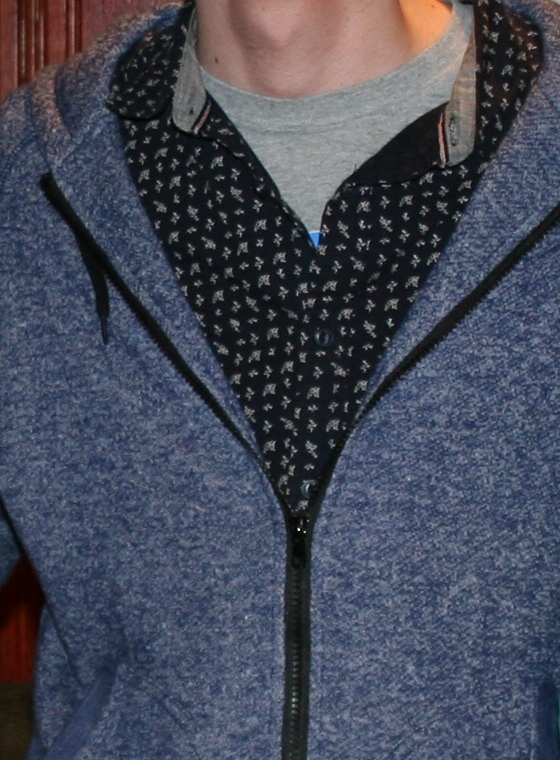 When I asked the other night about the design on his navy blue and white shirt, he said, “I just tell everyone they are dinosaur footprints.” They aren’t. It doesn’t matter. He is simply happy to have found trendy and comfortable clothing that fits his six-foot-three (or some such height) slender frame. He sourced his colorful pants at Japanese retailer UNIQLO. Yes, I had to Google the name; I’m not fashion aware. He shops online, too. This sudden awareness of fashion comes as a surprise to me. Only a year ago I waited outside a dressing room at Kohl’s as the son tried on a pile of sweaters and pants, rejecting most. Even getting him there had been a challenge. Clothes shopping has always been a challenge for him, mostly because he’s tall and slender and he’d rather do anything than shop. In the year between then and now, he’s managed to find clothing that not only fits, but that he likes. He’s figured it all out on his own. And bonus for me: Because he’s grown, I’ve now confiscated his flannel shirts, not that he would wear flannel anymore anyway. Flannel might be just a tad too Paul Bunyan Minnesotan for a college student in Boston. YOU KNOW HOW IT IS when a conversation starts and then rolls seamlessly from one topic into another and soon you have these thoughts spinning through your brain. Here’s how it started: Sunday morning a friend told me that her husband and youngest daughter rode along with their police officer son/brother during a Christmas night shift in another city in another state. That shadowing proved uneventful. I’m sure that was just fine with my friend. No mother likes to see her son placed in a dangerous situation. I shared that ride-along tidbit with my husband and son during Sunday dinner and then we were talking about my Uncle Bob, a retired Minneapolis police officer, and how he always said domestics were the most dangerous calls. Makes sense given the emotions involved. 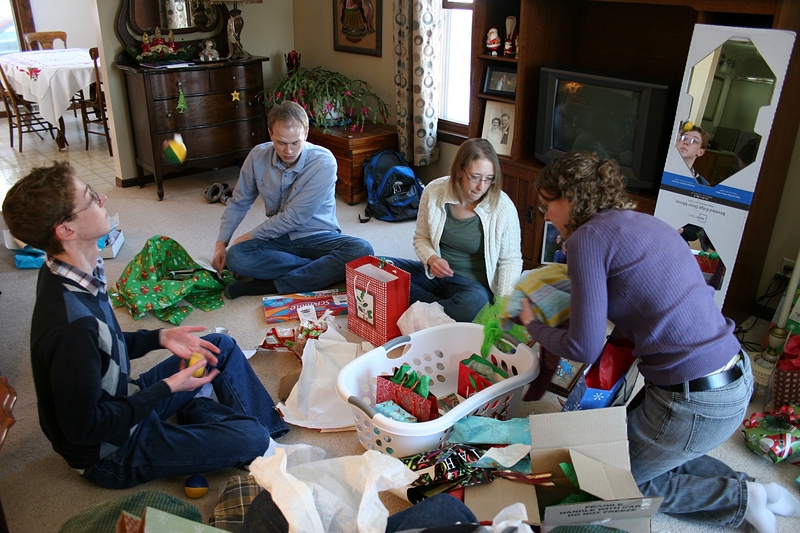 The holidays often see an increase in the number of domestics. Daily we hear and read reports of (mostly) women assaulted and sometimes murdered in cases of domestic violence. Saturday evening a woman was fatally stabbed in St. Paul, allegedly by her ex-boyfriend. Last week the Faribault Daily News, the newspaper in my community, published this headline: Faribault man charged with assaulting girlfriend, two police officers. The story included a photo of the 28-year-old repeat domestic abuse offender. I think I recognize the man. In late October, I phoned local law enforcement when I witnessed a young man verbally attacking, grabbing and shoving a young woman. I believe it is the same man now charged with fourth-degree assault on a peace officer and domestic assault. My stomach churned. A year ago, this man was convicted of felony domestic assault and violation of an order for protection. Now this. When will this ever end, this psychological control and manipulation, the physical and/or verbal assaults, the lies and deception that define domestic abuse? When? I’m not privy to details about the Faribault man’s past. But any felony charge and conviction is serious. And now to read in a newspaper story of his live-in girlfriend found crying and huddling in the corner of the living room holding their two-year-old…after she was allegedly attacked. I just want to take that young mother in my arms, embrace her, rescue her, and tell her everything will be OK. But I can’t save her; only she can decide to leave her abuser. I can’t promise her everything will be alright, that the judicial system will work, that this man will never harm her, or any other woman, ever again. It would be all too easy to give up. Yet, we cannot. Ever. As a society, as human beings, as parents who love our daughters, as sisters who love our sisters, as friends who love friends, we cannot simply walk away. The signature blue “vanishing point” in the NO MORE campaign logo evolved from the concept of zero, as in zero incidences of domestic violence and sexual assault. Like NO MORE, a national public awareness and engagement campaign focused on ending domestic violence and sexual assault, we must do all we can to end domestic violence. NO MORE ran a spot during Sunday afternoon’s Minnesota Vikings-Chicago Bears football game. That outreach to football fans was good to see. No more. Strong words. Let’s speak them, believe them, practice them. If you witness a case of domestic abuse, whether verbal or physical or both, call the cops. In the case of the 28-year-old Faribault man, officers were responding “to a report of a woman being grabbed by a man outside a home,” according to the newspaper article. Someone saw. Someone called. Someone decided, no more. 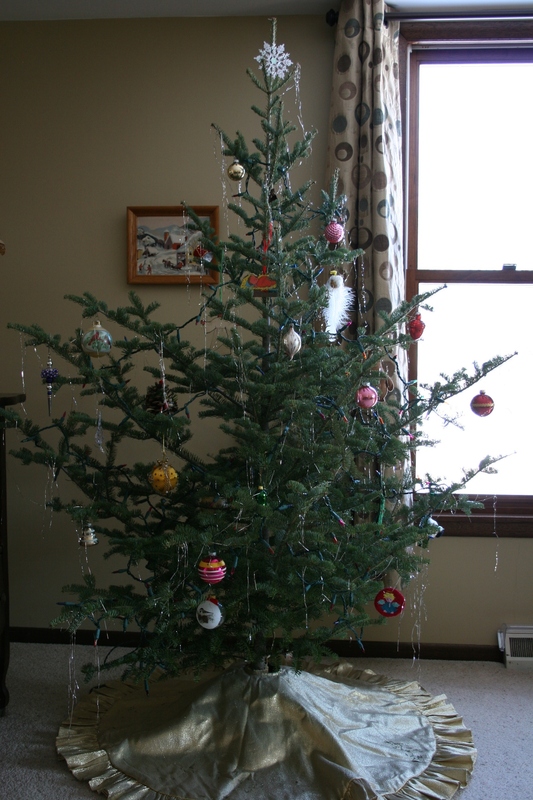 I absolutely love my Charlie Brown tree, an untrimmed Christmas tree purchased for $15 at a tree lot in Faribault. It reminds me of the Christmas trees of my youth, which makes it perfect. Branches are sparse and adornment minimal. I CONSIDER MYSELF A MINIMALIST. I don’t like clutter, an overabundance of stuff filling my house. Too much of anything makes me uneasy, unsettled. So when I set about decorating my house for the Christmas holiday, I am selective. More remains in boxes than is pulled out for display. I did not grow up with Christmas stockings. But my husband did. 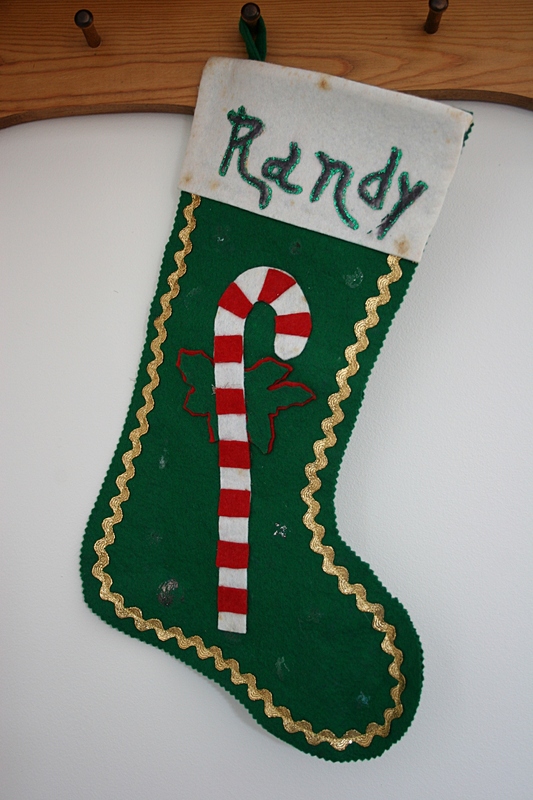 Randy’s aunt made this stocking for him in the 1960s. It’s missing a few decorations. But that adds to its character. The items I choose to set the holiday mood must meet my criteria of holding personal/family significance. The older, the better. Handmade ranks high. So does simplicity of lines. 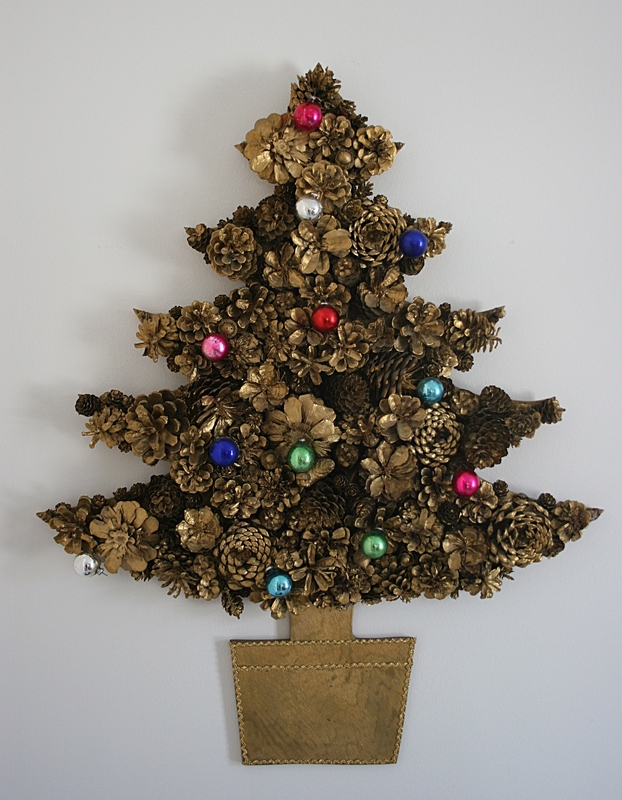 Found in my mom’s basement, this lovely pinecone Christmas tree was crafted by my godmother, Aunt Rachel, in the 1960s. This will now go up in my home each Christmas. This year, after cleaning my mom’s house and acquiring some old “new” items, my appreciation of the past has deepened. And that is reflected in the items currently displayed. 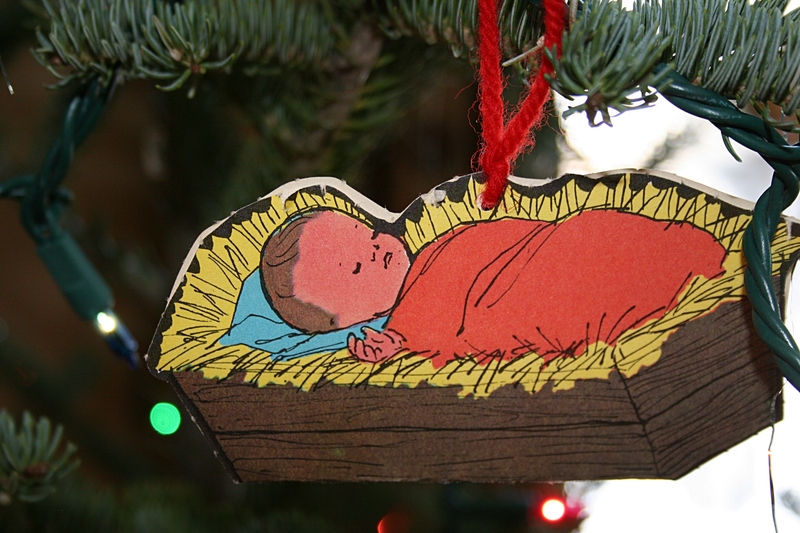 This paper Baby Jesus and an angel go on my Christmas tree each other. They are from the 1960s, from my Sunday School Christmas lesson. 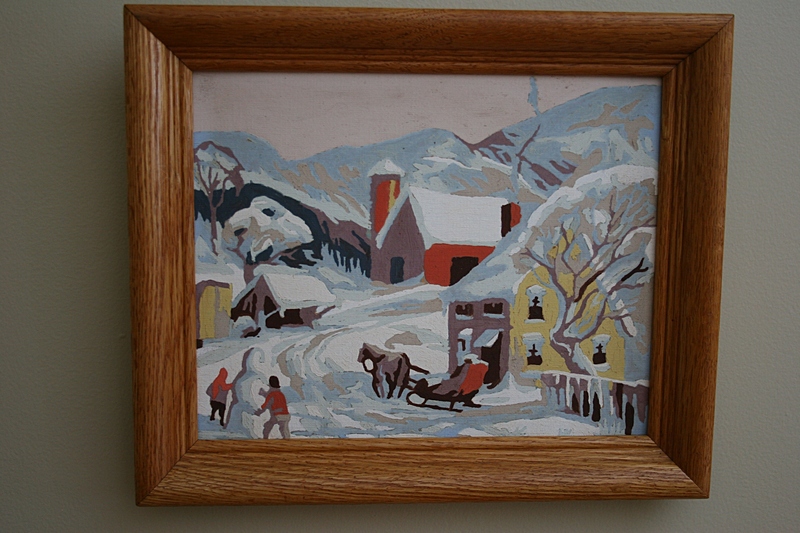 Behind the Christmas tree hangs this paint-by-number winter scene painted by my Great Grandma Anna. This was the perfect addition to my paint-by-number collection and was acquired when my siblings and I were dividing my mom’s belongings. My sister got the painting matching this one. This manager scene dates back to the late 1960s or early 1970s and was handcrafted by my maternal grandfather. 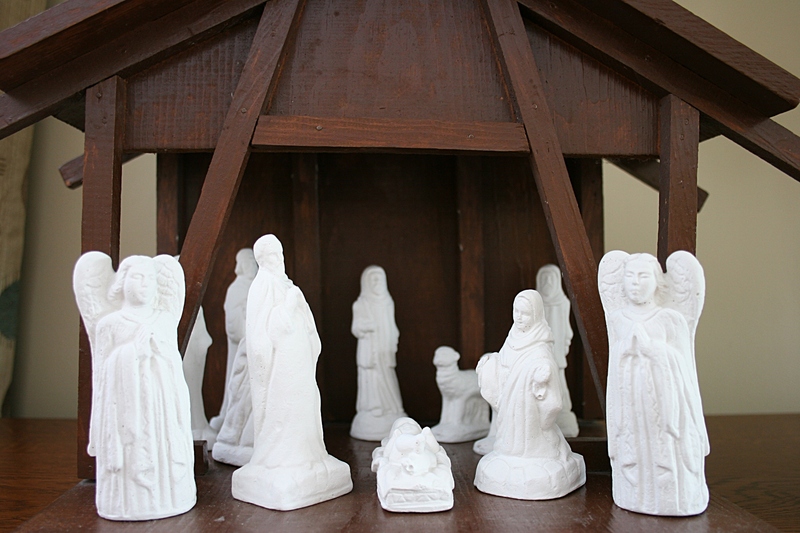 The figurines are made from Plaster of Paris. 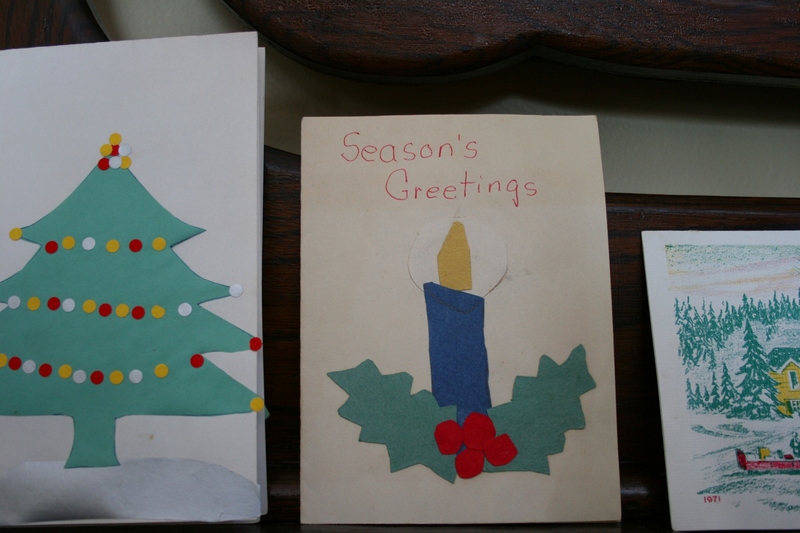 While going through a box of cards my mom had saved, I found several Christmas cards that I made as a child. This year I displayed those cards, along with a 1971 vintage card from Schwan’s Ice Cream (right) on an old dresser in my living room. The chest of drawers was used by my dad as a child. 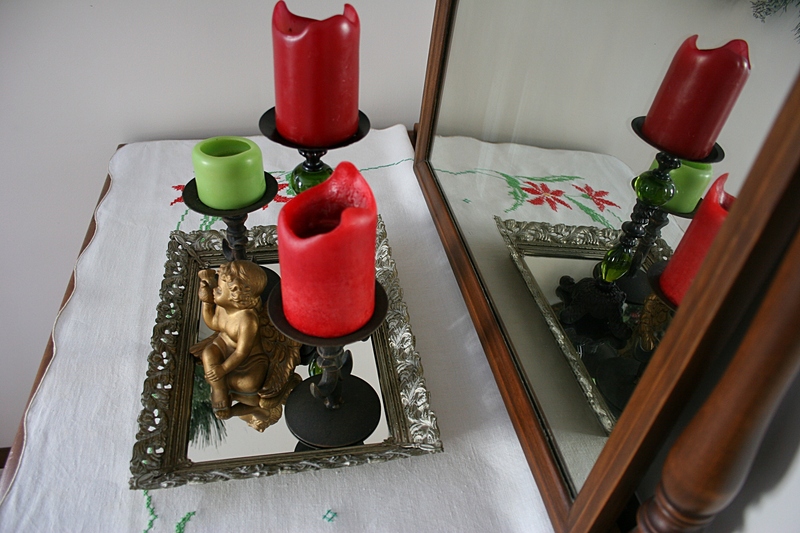 Around the corner on a vintage dresser from my husband’s family, I display candles and an angel on a vintage mirrored tray set atop a vintage holiday linen. 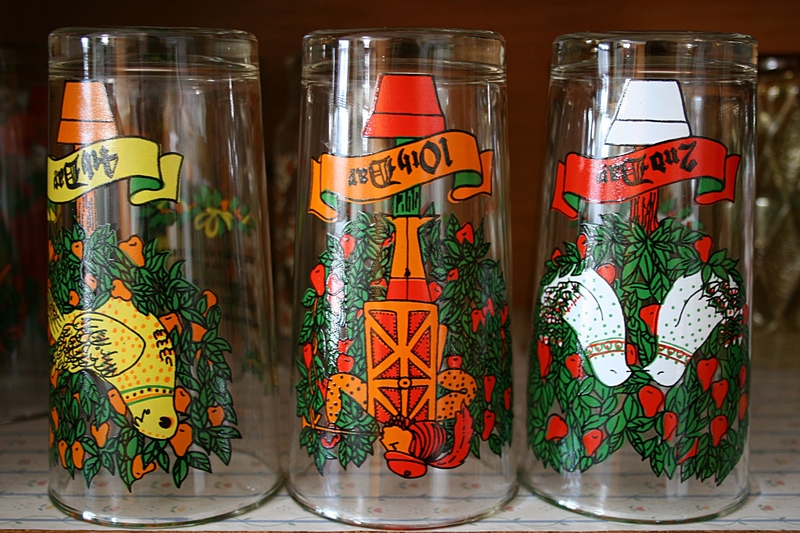 Come December, I swap out my regular vintage drinking glasses for the Twelve Days of Christmas glasses. These were gifted to me in 1978 by the furniture store across the street from the newspaper office where I worked as a reporter and photographer in Gaylord. Since then, I’ve acquired the same set of holiday glasses for each of my three children at garage sales and an antique shop. Three net angels dangle from the hallway light fixture. They are just like the angels my mom dangled from the living room doorway when I was growing up. 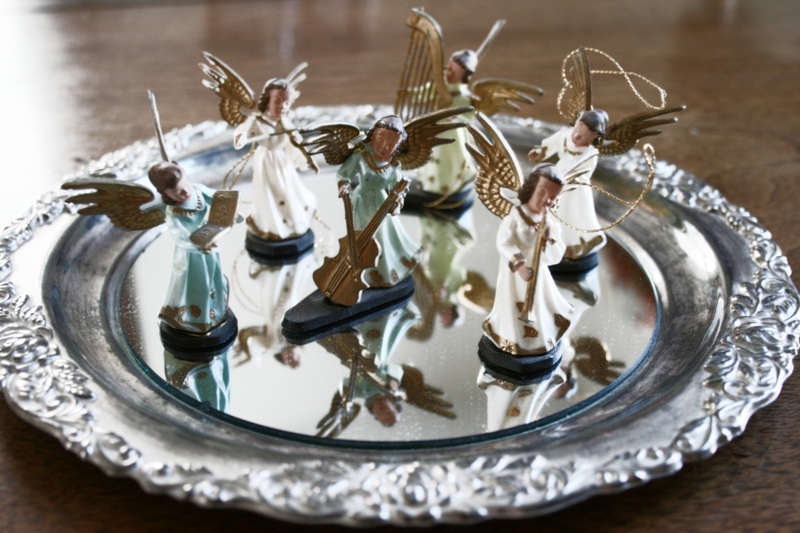 My oldest brother and I purchased this set of miniature plastic angels from a small town hardware store for our mom as a Christmas gift in the 1960s. Several years ago my mom gave them back to me and I display them each Christmas. 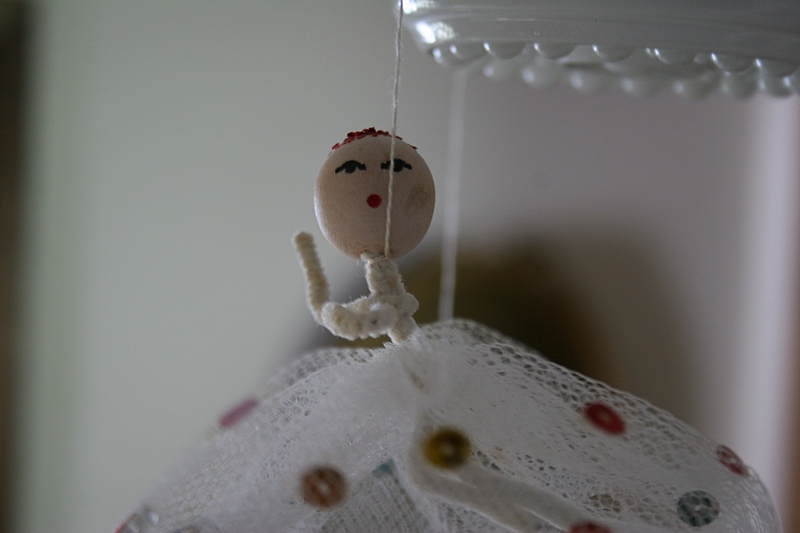 This angel band is among my most treasured of holiday decorations. 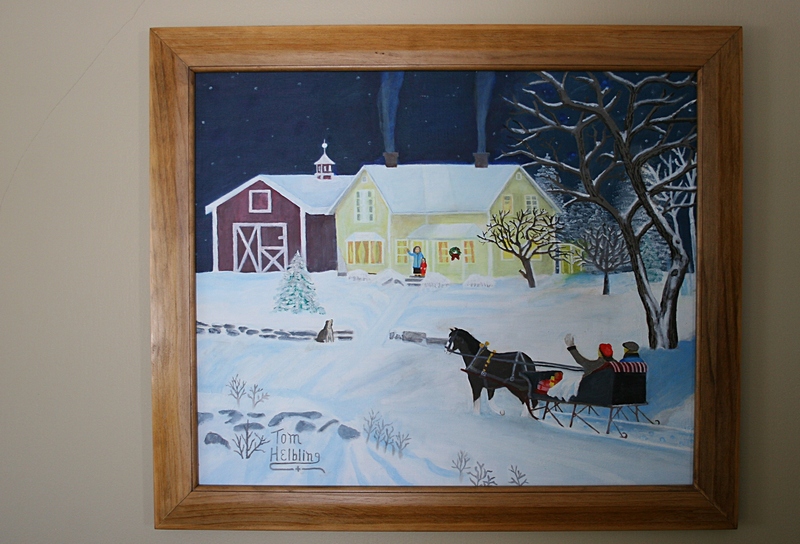 My father-in-law painted this holiday scene, which is why I treasure it. Plus, I really like the painting that hangs behind my couch. 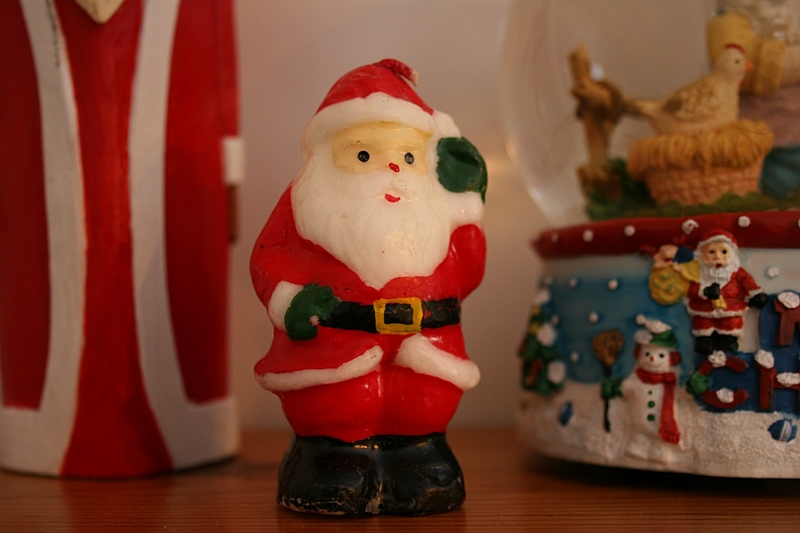 Back in the day, when my dad’s siblings and their families still gathered for the holidays, I received two candle Santas and a snowman from my Aunt Ardyce during a gift exchange. A match has never touched the wicks and never will. I cherish these as much for their vintageness as the memories of so many Christmases past with aunts, uncles, cousins, Grandma and my own siblings and parents. WHEN MY ELDEST DAUGHTER first suggested it, I questioned how we could have Christmas without gifts. Turns out we can. Sort of. After a family vote, in which we all agreed to not exchange gifts, we didn’t. A gift from a previous Christmas. Minnesota Prairie Roots file photo. About a week before Christmas, I considered that I am the mom and thus have the right to break the new rule. And I did. But I didn’t rush out to buy gifts for my husband, all three of my adult children and son-in-law. Rather, I looked first at what I already had in my home. Each daughter received a handmade apron belonging to her maternal grandma. I also gave the eldest a puzzle map of the U.S. Turns out, though, that when she opened the gift, Amber thought she was getting her own puzzle back. Nope, I clarified. That puzzle you played with during your youth was a childhood Christmas present to me. Best cherish this vintage puzzle, even if Kentucky is missing. The second daughter also got a vintage print I picked up this summer. It’s a print of a girl and a bird which nearly all of the women in my family own—one of those family things. Miranda’s favorite present, though, seems to be the poem I wrote about her. That left the men. The son-in-law was easy. He loves blue cheeses made and cave-aged in Faribault. A block of cheese it was for him. But the 20-year-old son proved more challenging. In principle, he’s opposed to gift cards. Scratch that off the list of easiest possibilities. So I just asked him what he wanted and he ordered it online with delivery promised in two days. Problem solved. The package arrived when he was sleeping. I wrapped the watch and tossed it under the tree. The husband will get his present, homemade Date Pinwheel Cookies (like his mother used to make, except better, he says) once the surplus supply of sweets in the house diminishes. 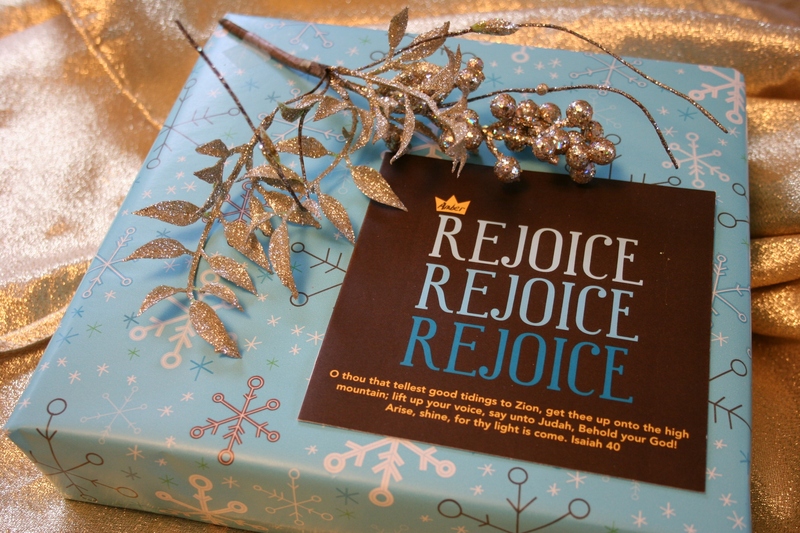 As for me, I, too, found a gift—a box of chocolates—under the tree with my name printed on the wrapping. Sweetness from my husband. My desk caddy Christmas gift. And then there was the surprise, a small square package which, had I not known its source, I might have thought contained jewelry. When I ripped off the paper on Christmas Eve, I found a desk accessory painted in vivid hues of orange, blue and my favorite lime green. 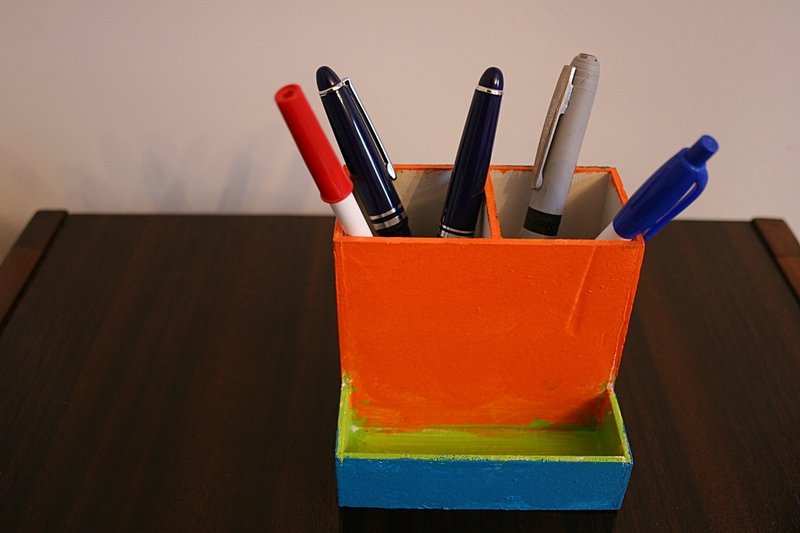 Perfect for pens, pencils and paper clips. Darling little Nevaeh, elementary-aged daughter of friends, painted the organizer and delivered it days earlier along with a jar of homemade sweet treats. Aren’t those the best gifts, the ones crafted with love or the ones that hold personal significance? Today, when many of you are standing in line to return items like the zebra-print sweater from Aunt Edna or the bulky loon slippers or the set of screwdrivers you don’t want because they are cheap, I won’t be returning anything. It’s not like I would ever return a box of chocolates. As for the no Christmas gifts rule, I have mixed feelings. Drawing names so each person receives one present would suit me better. But then again, I didn’t miss the shopping, trying to find the perfect gift. Not one bit. No presents eased a lot of holiday stress. The original proposal, to do something together as a family (like attend a holiday play at the Guthrie Theater in Minneapolis) instead of exchanging gifts, was a great idea in theory. But with the son living in Boston and one of the daughters living 300 miles away in eastern Wisconsin, it didn’t work. You have to all be together. Christmas two years ago, when we were all together and there were lots of gifts given. Minnesota Prairie Roots file photo. 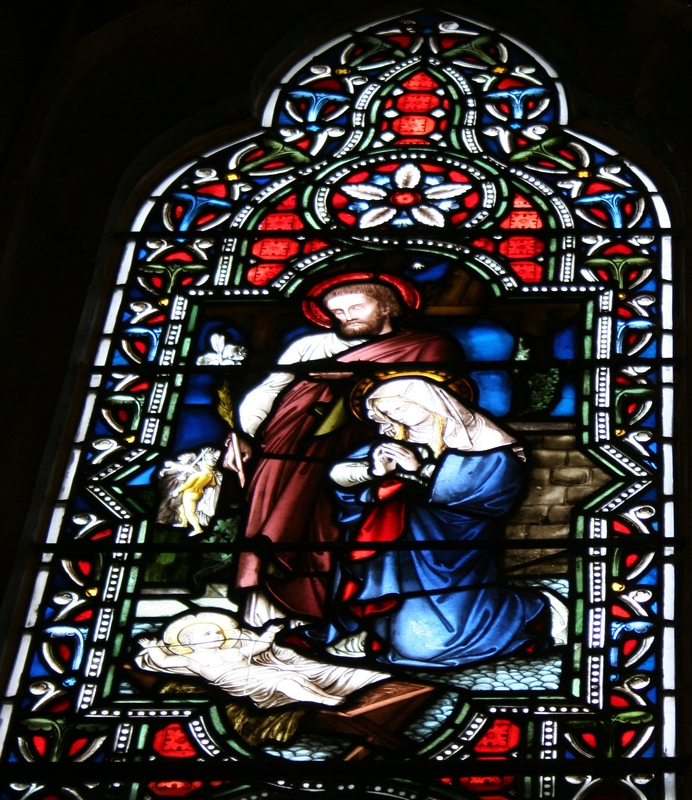 A stained glass window depicting the birth of Christ, Chapel of the Good Shepherd, Shattuck-St. Mary’s School, Faribault, Minnesota. From my family to yours, best wishes for a most blessed Christmas! LAST SATURDAY I WENT “home” for the holidays. Back to my native southwestern Minnesota prairie. Back to see my mom and siblings, in-laws and nieces and nephews. Twenty-nine of us gathered to celebrate. Three were missing. 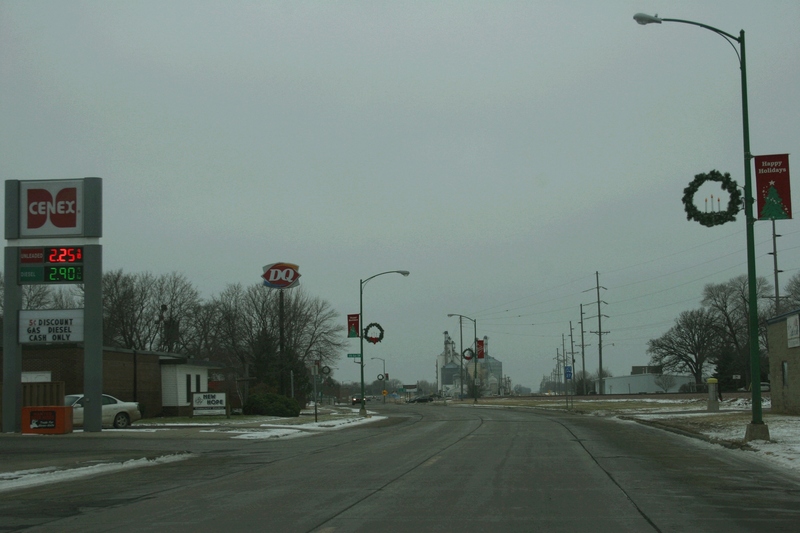 U.S. Highway 14 curves toward grain bins on the west edge of Sleepy Eye. To get there, we journeyed through many a small town, first along Minnesota State Highway 60 and then onto the Laura Ingalls Wilder Historic Highway, U.S. Highway 14. Through towns like Elysian and Madison Lake. Past Mankato. Through Nicollet and Courtland and New Ulm. Then on to Sleepy Eye and Springfield. 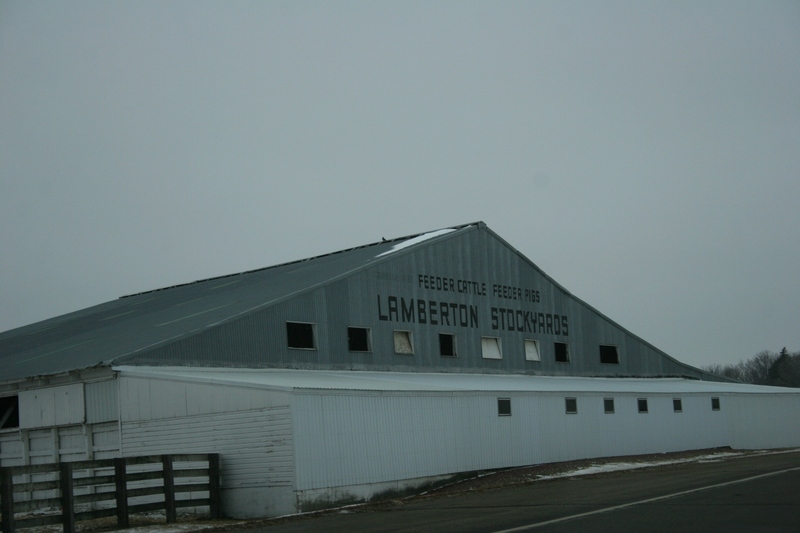 Entering Lamberton from the east, the Lamberton Stockyards. And finally, west of Sanborn Corners, to Lamberton. Past the Gypsy Park and then turn right at the Chicken Pox Factory. Unless you’re in my family, you won’t understand the park and pox bit and I’m not going to explain. 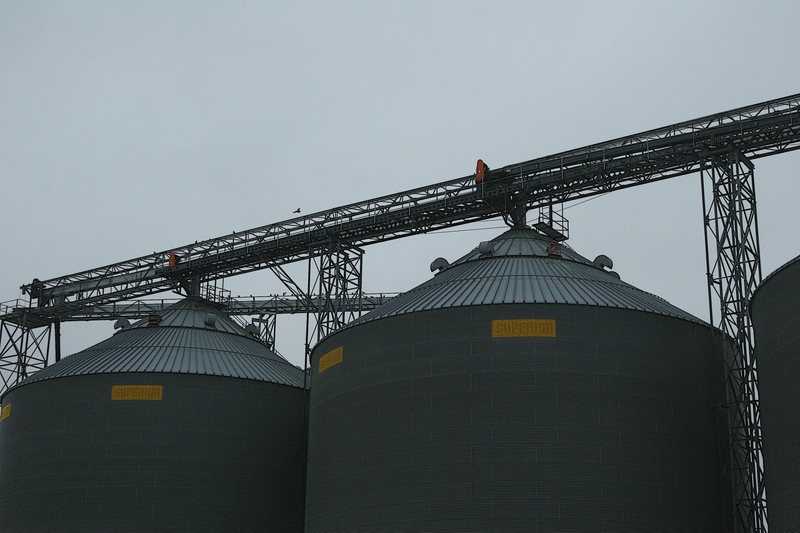 Grain bins, like these in Sleepy Eye, mark the prairie. So many farm sites have stood here for generations. 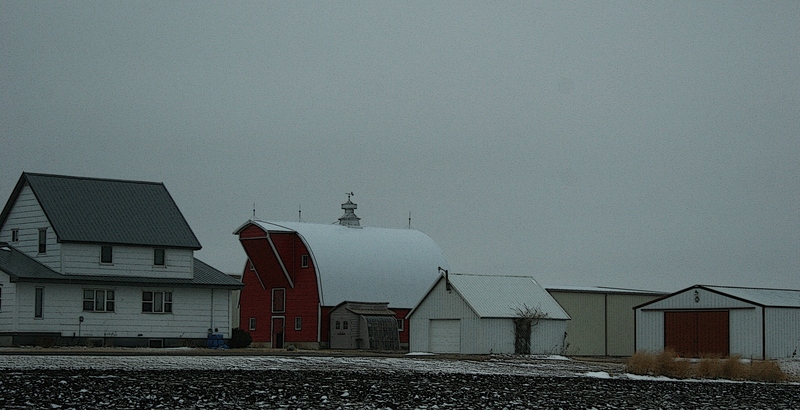 There are many well-kept barns and farm sites along U.S. Highway 14 between Sleepy Eye and Lamberton. As we traveled, I studied the land and farm sites, the communities, the details that define the prairie that shaped me. 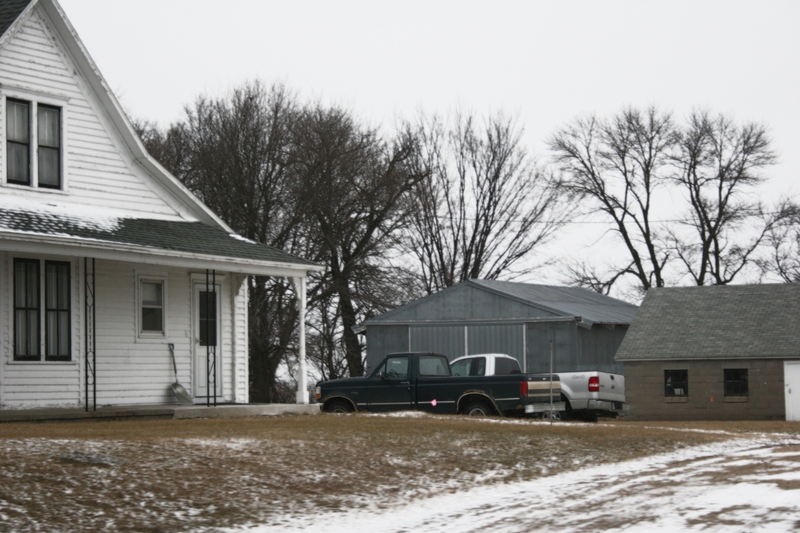 Someone’s rural home on the southwestern Minnesota prairie. Oh, how I still love this land. It was good to be home, if only for a short while. Wherever you travel this holiday season, may your journey be safe, your time one of joyful celebration. YES, THERE WERE TEARS and clinging to Mom and Dad. But eventually 2 1/2-year-old Hank came around. He cautiously inched his way down the basement steps, where Santa waited at the bottom. 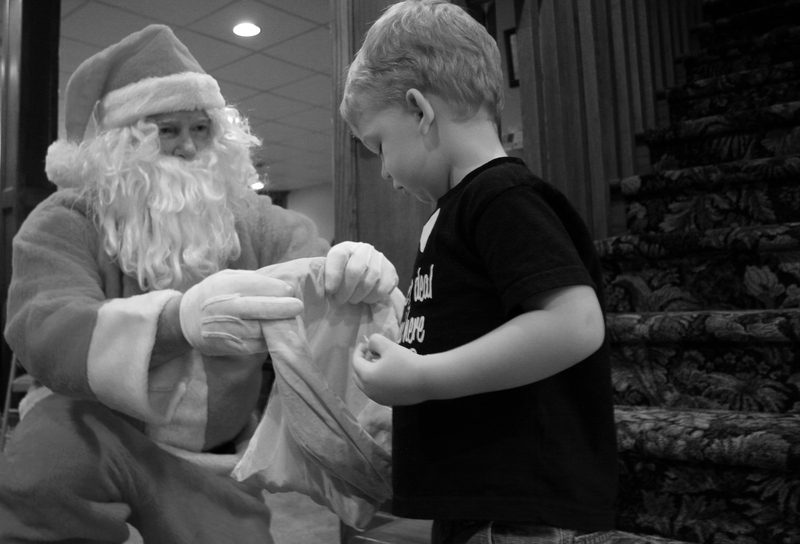 My great nephew, Hank, age 2 1/2, picks candy from Santa’s bag at the Kletscher family Christmas gathering. Santa’s bag of candy proved too much to resist. Last year Hank was afraid of Santa. 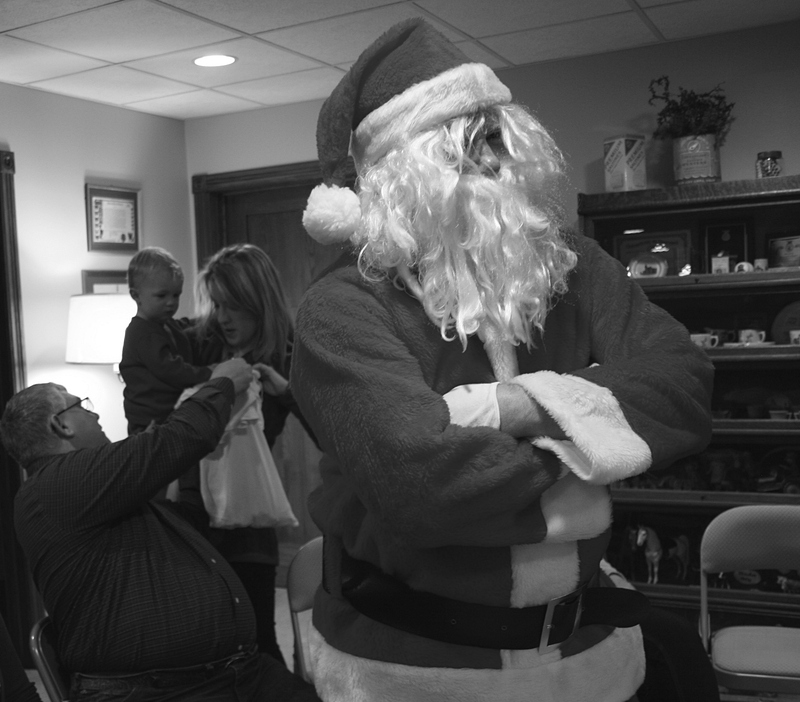 So Santa, being the nice guy that he is, stepped aside and turned his back. Then Hank, sheltered in his mom’s arms, and with the help of Grandpa, got his candy. 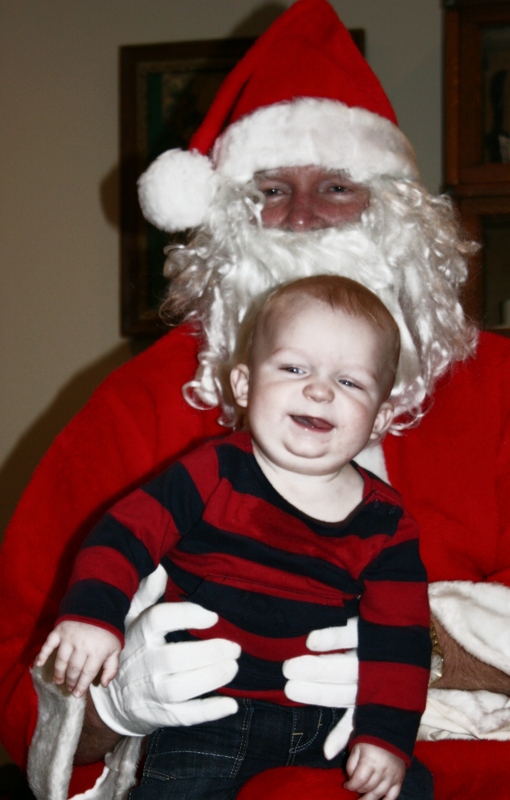 In 2012, when he was six months old, Hank was all smiles sitting on Santa’s lap.